Mars will be closest to earth (at opposition) this year on July 27th. It will be at its closest to earth since 2003. If you observe on that night you will likely be disappointed. A full Moon will be less than 8 degrees from Mars. Your view of Mars will be marred by reduced contrast from the glare of the Moon. Although the closest approach occurs on the day of opposition, an opposition is part of a planetary dance that plays out over weeks with negligible difference in the apparent size of the planet. This gives us a chance for a better view. Between July 27 and August 3 Mars will appear nearly 7 times larger and over 60 times brighter than it was a year before in 2017. This dramatic difference is because Earth and Mars have adjacent orbits around the sun. The distance between them is much closer when they are on the same side of the sun than when they are on opposite sides (roughly 7 times, 57 vrs. 400 million km). Mars will be at it’s maximum size for a week and over 98% of it’s maximum size for three weeks! We can analyze the separation of Mars and the Moon during opposition. For best results I like to make sure that no direct light from the moon can reach the entrance of my telescope. The diameter of my lens shade is 100mm and I can extend it 150mm beyond my telescope. This means that Moon must be at least arc tan(100/150) or 33.4 degrees away. Because the moon is 0.5 degrees in size, I’ve rounded this up to 35 degrees. A 35 degree separation from the Moon will work well for most telescopes. You can modify these results for the geometry of your own telescope. By all means take a look at Mars on July 27, but be sure to observe in the other two windows! With almost two weeks to view Mars without interference from the moon, you are sure to find clear and steady nights for a spectacular view. With the moon out of the way, the two most important factors for a good view are a clear sky and a steady atmosphere (good seeing). The tools on the Astronomical Forecasts page will help you pick the best dates and locations from the dates above. Weather on Mars will also effect your view. Mars has planet wide dust storms that can last for weeks. You can check the latest weather report with dust conditions on Mars including images from the Mars Reconnaissance Orbiter courtesy of Malin Space Science Systems. This year Mars will appear 2/3 larger than the image below from a few weeks before the 2014 opposition. Typical values range from 1 to 16 microns. Look up your camera’s sensor specifications for the value you should use. For example for an image of Mars, with an apparent diameter of 24 arc seconds, to have a diameter of 100 pixels in diameter will require an effective focal length of about 3440 mm using a camera sensor with 4 micron pixel pitch. 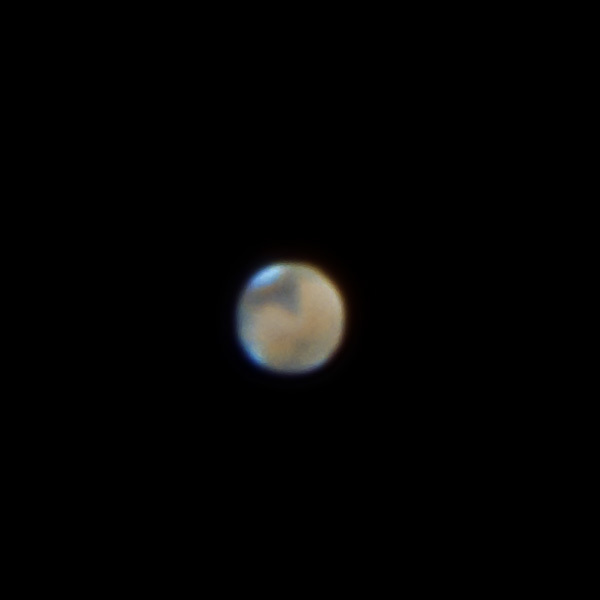 Most telescopes will require an added Barlow lens or eyepiece projection to increase the effective focal length enough for a good size image of Mars. W = 200 / (8.6 * 4) = 5.8 pixels in diameter, not nearly enough to show any interesting detail.